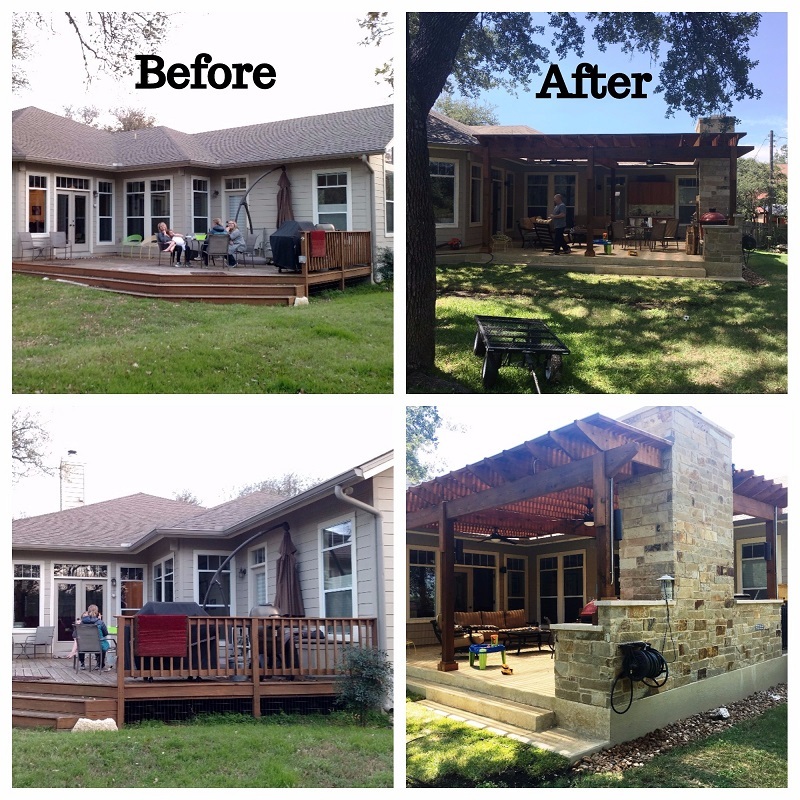 From simple deck to rugged Texas backyard man cave … Score! 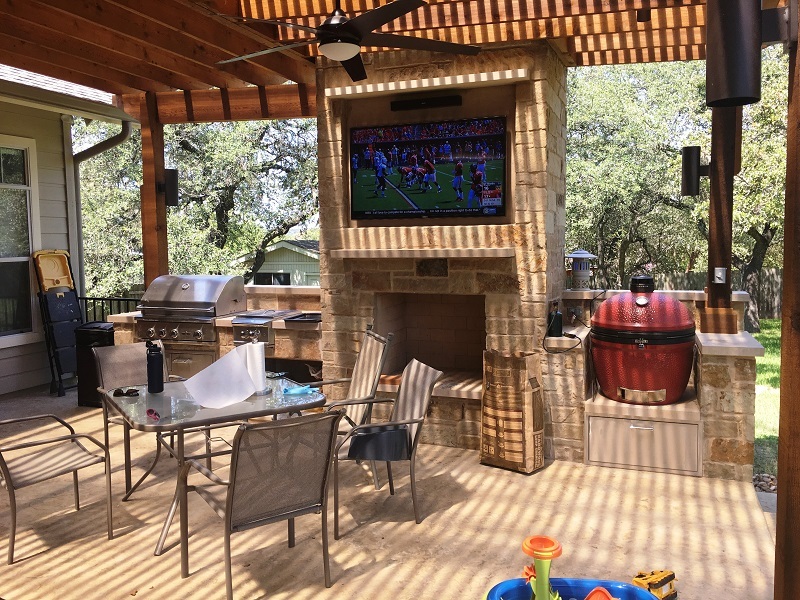 Tucked between the Austin neighborhoods of High Vista and Northview Hills, this rugged pergola/covered patio/outdoor kitchen with stone fireplace takes “combination outdoor living space” to a new level. We are dusting off our hands and standing back to admire our own work now that it’s completed. This project presented an interesting footprint to work with because the home had a hip roof with two valleys leading into the same area. Initially, the homeowners wanted to build a roof over the whole space, but when they had an architect design that, the roof would have required posts just about everywhere for support. There was really no perfect way to tie into the roofline given its shape. So, Archadeck of Austin designed a pergola structure that is both attached AND freestanding. This innovative design allows for water drainage without the hassle of tearing out the home’s rear roof system and rebuilding it from scratch. The result is a stunning outdoor room sheltered by a beefy pergola that’s covered with Polygal multiwall plastic sheeting. This covering provides thermal insulation as well as protection from sun and rain. Light passes through, but not the heat, giving you the best parts of being outdoors. To begin this project, we removed the existing deck and poured concrete to create a patio. The new patio surface is textured and stained concrete. We ran conduit from the attic to bring electrical wiring as well as hot and cold water to the outdoor space — definitely a requirement for the outdoor kitchen we built at one end of this covered patio. 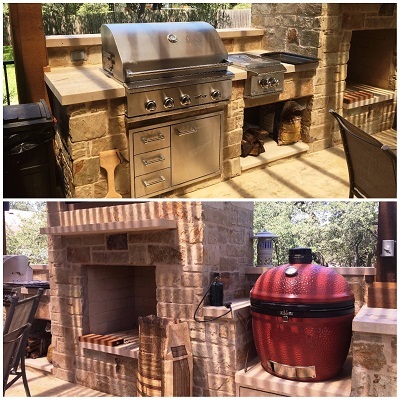 The outdoor kitchen features an infrared grill that can sear a steak up to 1200 degrees. The homeowners, from Louisiana, also have a large Kamado Joe smoker; its 14-inch power burner system is perfect for the outdoor crab boils they enjoy hosting. The sink area also features beautiful wood cabinetry built with marine-grade plywood. 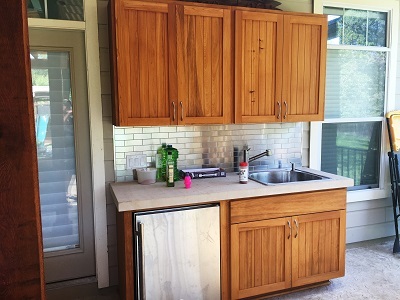 The cabinet doors are hand-stained cypress. All of the plumbing is inside the back wall of the kitchen structure, protected and out of view. The backsplash of the sink area, chosen by the homeowner, is porcelain subway tile with a stainless steel cover. We brought in a tile specialist for the job. The large pergola overhead, supported by only five posts and a partial roof tie-in, is wood stained with a California cedar color. The centerpiece of the space —you see why we call it a man cave — is an imposing full masonry outdoor fireplace with a huge flat-screen TV mounted over the mantel. The overall space was designed to accommodate this TV. The fireplace and outdoor kitchen feature stone facing by Canyon Stone in their Santa Fe color, a mix of tan, light brown and gray. If you take a close look at the stone mantel, you may be able to see a stone lip above the TV. The homeowner actually taught us this trick. The protruding stone lip protects the TV from water, should the counter flashing fail. If water penetrates the area, it will drip directly onto the floor, away from the soundbar and TV, without ruining the electronics. It’s a “drip cap” of sorts. It’s hard to tie a pergola into a stone fireplace to make it water-tight, so we are now using this technique on all of our pergola projects that feature a TV above a stone fireplace. An added benefit is that it shades the TV screen to eliminate glare. 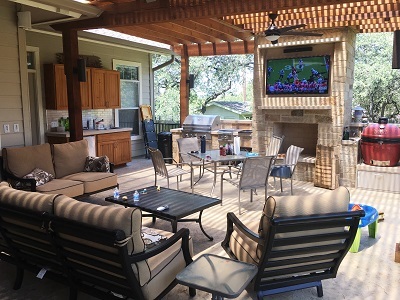 These Austin homeowners are thrilled with their new-and-improved outdoor living space and are already planning quite a few events to entertain friends. It’s safe to say a number of these events will revolve around football games on TV this fall. 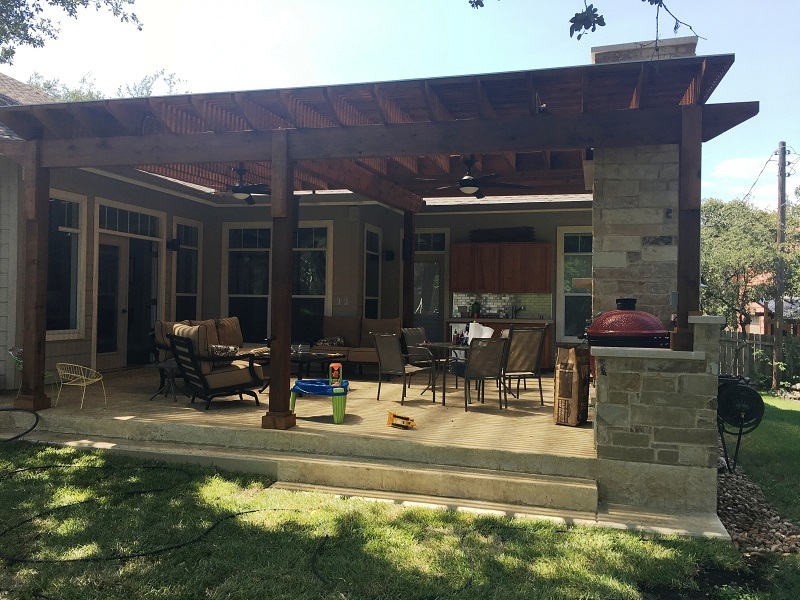 If you would like to learn more about creating the pergola/covered porch/outdoor kitchen combination project of your dreams, contact Archadeck of Austin today at (512) 259-8282 or via email at [email protected] to schedule a free design consultation.